Personally, I don’t like robots, cause I’m close to that. Some might suggested being me an android, well, do I really care? Yesterday, my brother Ehsan who is studying in UBC (University of British Columbia, Canada) has sent 3 HexBugs. While showing the working procedures to my children, I found the “Charlie Bug” wasn’t working. If I recall my daughter’s version, it is dead. One of her legs also got flatten due to the fact long haul flight’s luggage handling. This one [pink version] was destined for my daughter. I looked at her. The next thing I know, I have to fix it by night. I googled for an hour or two, I could get the diagram and reassembled the clutch chassis to get it working right. But it opened up other possibilities what other HexBug hackers had been doing it. Well, all you need is an 8 pin, Microchip PIC microcomputer, might be few millimeters at length! Assembly codes? Basic HexBug comes with limited “personality” or behavior to lower the cost. This tiny little six-legged robot will move forward until its antennae bump something, then it backs up and turns left. You will see loads of “bump and forward” toys, but it has real time legs, where it has to decide things. The best part, you can add more personalities with a help of a micro-controller and numerous sensors to behave differently. You can add a light detector, and can be programmed to get to the brightest place in your room. The HexBug could eventually ‘go to sleep’ when it’s dark, and can always be active when it is morning. The HexBug would be able to check its own battery voltage, and ‘Cry’ for newer batteries when it is hungry, or when it is running out of batteries. This HexBug could get to ‘hibernated’ mode like our laptops instead of just being awake all the time. During sleep mode, the microcomputer barely uses any power. It can talk if you add a piezo-buzzer, depending upon the environment you are making it to go through. It can sing songs on your birthday and all Eid days! If you could add a tiny solar cell, which is available, it can walk up to a brighter location to recharge when it finds out low voltages in its batteries. If you could add an IR-control module, it can even talk to a TV remote! You can add some programming to seek out a ‘gas/charging station’ that uses an IR transmitter to locate the station and recharge its batteries. If you add IR Proximity sensors, it will never fall down from your table. Edge detection is pretty much required here. Adding a GPS can add the functionality to send it to your friend’s house to deliver cards. Actually, you can do almost everything using modern world electronics and sensors, welcome to the world of robotics! Please feel free to visit this HexBug Hack site! If you ask my recommendation, Robotics Site at NASA should be the first one! Ten Incredible Places You Want to Go Before You Die! Darn, I hate Travelling. Cause, it used to make me sick when I had to get to newer places every other month. Don’t get me wrong, going places has always been one of the more annoying aspects of my life. Actually, most people absolutely are enthralled with the idea of physically getting to some places. Well, I just want to get there! But, my job was keeping me on my toes. My current occupation is a decent way of life, but keeping the young officers busy with loads of trainings has its merit. They tend to learn pretty quick! Now, when I’m attending post graduate classes with hundreds of other young students, I can’t catch up – that’s what we call it “old brain”! It seems that I’m coming over from ice age. If you consider my diverse travelling – or if I had a mileometer attached to my legs, it would have been few hundred thousands of miles, not less! Excuse me? I’m not exaggerating a bit. I fired up my IRC client, “what ten incredible places you want to go before you die?” Hridi asked from her irc window without those “hi” thingies. She just logged in from Fairfax, VA, my long time undernet pal. Then I thought of Lee Ann Womack. I can’t think of ten best places right now, but I still regret a chance of a lifetime to visit New Mexico when I had been in SFO this year. 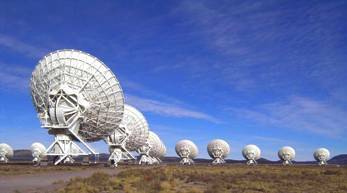 I dealt with Radio Communication for almost eight years in my previous placement and I love Antennas! 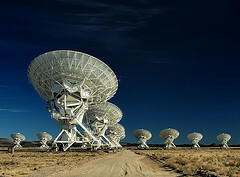 “Contact” would be one of the great movies which covered the very large arrays (VLA) installed at Socorro, NM. Surely, this is one of those ten incredible places I want to visit before I die! CQ. This is W9GFO, do you copy? Dad, it’s Ellie, come back. At this point of the movie, my vision blurs up with tears. Normally, I don’t cry watching movies, but I rarely escape a good movie without leaking fluid. I’m not arguing, but our hearts are the biggest radios in this universe! Currently Listening to: The First Cut is the Deepest: Sheryl Crow. Reading: Characters, Emotion & Viewpoint; Nancy Kress. Photo Credits: David Teter, Flickr and Marc Valdez. Its okay when you have some time to waste and then you watch a not-so-cool a movie. It was weekend time and I have been flipping through the channels while babysitting both my children. I stopped when Keri Russell popped in. I love her acting as I had been an avid fan of Felicity. It’s been a great show from Warner Bros TV, I looked it up in Dhaka several years ago, no sign of it! Later, I had to get all the episodes as I visited San Francisco, CA this year. If you still can’t recollect her face, please look it up in your video library; at least for “Mission Impossible 3” and “The Upside of Anger”. Keri lets each new feeling shine through her skin, it is! And The New York Times says it all, “If Waitress were more strenuously uplifting, it might be labeled a feel-good movie, but it isn’t that. It’s just a movie that leaves you feeling good.” The best part is that these characters aren’t perfect like most of the movies we see every day; who in this flawed world can ever be that perfected? Are you asking for the second reason why I fell for this movie? Did you over hear the lines when Dr. Pomatter was holding Jenna? Dear Baby, I hope someday somebody wants to hold you for 20 minutes straight and that’s all they do. They don’t pull away. They don’t look at your face. They don’t try to kiss you. All they do is wrap you up in their arms and hold on tight, without an ounce of selfishness in it. Now, who wants to start afresh? Do you believe in fairy tales? I don’t know how things are at your part of the world, but I love fairy tale film adaptations. This movie is amazing and so is it’s soundtrack! I always loved Disney’s score and it even crossed my mind. This one is mostly based on a combination of fairy tales from Snow White, Cinderella and Sleeping Beauty! What else you want? I know, my heart is little messy right now, today being the Eid day and I just touched down my country after 18 days of extensive training. But, I really loved the musical part. It has a great story, but how did they manage to get Alan Menken? As usual, Alan Menken has provided a fantastic score, and the songs he’s written with another guy are lovable, smart and tuneful. Most of the films I watch; don’t push me harder to get the soundtrack on the same night, but right now I’m already on iTunes. “Girls Gone Shopping” score will make my player to run in forever mode for this holidays. Here, you might not like it but he actually moved away from traditional pure orchestral scoring, instead he chose using more upbeat and influences from popular music culture. Surely, this is the need of the time. What can you say? Hollywood Studio Symphony’s works are great for other scores too!! And, then I thought of something, why did I like this movie so much? Love at first sight, do I tend to believe that? Yes, I do. But, the foremost, I might also want to escape from all of today’s intricacies of life. Life was so much better then!